One thing for sure is that the sport of Powerlifting in this state is going from strength to strength in both participant numbers and lifting standards. 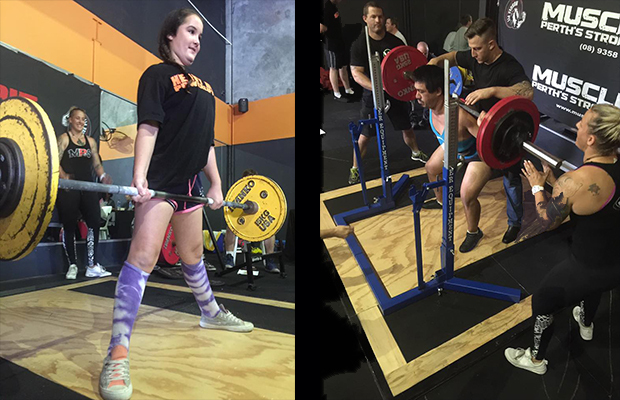 Of the 23 lifters that took the opportunity to participate at WAPA’s first novice Powerlifting competition for 2016; 20 were doing their very first competition. The great thing about novice comps is it gives the less experienced lifter an easier birth into the sport as the event is refereed a little looser and there are many established lifters on deck willing to offer help to make the day more enjoyable. So…. with Emcee Mr Adam Coe on mic, scorers, refs, spotters and loaders in place along with 24/7 Power Fitness Maddington host Chris Winter on BBQ duties it was GAME ON……. First up and one of the highlights of the day was Heavy Duty Gyms 11 year old (that’s right 11 years old) mini tornado, Ella Earle-Clarke. Weighing in at only 54.8kg she got everyone talking not just because of her age but her numbers were solid. Ella squatted just short of body weight before finishing the day with a Deadlift of 62.5kg. Her 35kg Bench wasn’t too shabby either. For such a young age her composure on the platform was commendable, which all hints there is something special in the making. New comer Seanne Rawin started nervously but as the day progressed she seemed to relax and found her rhythm on the Deadlift; hitting white lights on her last 3 attempts finishing the day with a solid 140kg pull and a combined total of 260kg. Michelle Earle-Stone has been pretty active this year taking the opportunity to compete in each of the WAPA events. For the Earl-Stone household this event was made more special with the inclusion of Michelle’s daughter Ella lifting on the same card – which emphasises how Powerlifting can encompass all ages and involve the whole family. Michelle’s performance today was a good warm up before the State Championships next month finishing with a 282.5kg total. Next up was Wallis Beresford who was one of three lifters from Resurgence Training Centre that took part at this event. All three have been mentored by Muscle Pit’s Jess Day since her return from N.Z. and it showed. Wallis looked solid all day missing only one lift on a technicality. I think her potential has only just been scraped and I feel we will be seeing some much bigger numbers from her if she sticks with it. Heavy Duty girls Georgia Stevenson and Ria Maddox, probably not aware at the time, fought out a great battle for third spot with only three points between them. Georgia finished the day with the heavier total of 285kg compared to Ria’s total of 265kg but with the weight co-efficient in place, Ria with a body weight of 60kg managed to claim third place. 24/7 Power Fitness Maddington’s Sharline Schnur weighing less than 60kg had been lifting steadily all day before hitting the turbo charger on the Deadlift section. She produced a massive two and a quarter times bodyweight final Deadlift of 135kg to edge past Ria’s total by 2.5kgs finishing with a 267.5kg total and second place. Partaking in her second ever comp, the clear cut winner of the women’s section was Hayley Rau. Her Squat of 140kg (PB), Bench of 67.5kg and Deadlift of 142.5kg (PB) at 75kg body weight was impressive. Not to diminish her training but Hayley is naturally gifted in the strength department, if she ever decides to focus seriously on the sport she has the potential to develop into one of the very best lifters in the state if not the country. The Men’s section had 15 lifters with only two having had previous platform time. With novice competitions it’s not unusual to see the odd lifter “bomb” (fail to complete a successful lift in one of the disciplines) which is mainly due to their opening weight being a touch too heavy – the Squat (due to depth needing to be below parallel) and Bench (due to the pause on the chest) being the main culprits. That said, it was no different at this comp with Folau Pofaiva failing to make a successful Squat, and Kennedy Waife, Levi Kissick-Ponga and Dane Riini unable to register a Bench-press. Each lifter however was permitted to continue and their successful lifts on the day suggests with a little more strength specific training and time on the platform they will develop into very good lifters – especially Dane Riini who at 17 was the youngest male lifter on the day. Llyod Rogerson decided to just focus on the Bench portion of the event pushing out a solid 130kg press before falling short on his final attempt of 140kg. Muscle Pit duo of Wayne England and Alex Jeffrey performed well and will grow from the experience. Jesse Warner looked pretty composed during the event and was successful on all nine attempts finishing with a 385kg total. Andrew Pickering has only recently joined the team at Muscle Pit and his 450kg total is just a hint of things to come. In my brief observation he has a good work ethic and attitude both important attributes for success in this game. Andrew is capable of totalling high 600’s within the next 12 months. Erwin Latip representing Wanneroo Health and Fitness, who was one of the two men lifters with previous platform experience, is gaining confidence with each outing. His last Deadlift attempt of 240kg was the heaviest of the day and won everyone’s vote for “Grind of the day”. It was pure stubbornness that prevented him from quitting. Erwin finished with very commendable total of 500kg. Training from home is never easy but Michael Male made a good show of things making 8 of his 9 lifts and produced a 425kg total on the way to his fifth place finish. In fourth position and weighing in at 81.4kg was Aaron Deacon. His total of 405kg was pretty good for his first outing and hopefully the experience gained on the day will keep the fire burning to destroy these numbers next comp. Now to the big three…. Resurgence Training Centres David Tuliloa at 21 years showed a tonne of raw talent. Tipping the scales at 132.4kg, the boy is a monster. With the right guidance David could really impact this sport. His only misses where on minor technicalities. Finishing with a 215kg Squat, 130kg Bench and a 260kg Deadlift for a 545kg total and third place, David is definitely a rough diamond in need of a polish. The most experienced lifter on the day was 67.5kg lifter Reuben May. Reuben heads up the 24/7 Power Fitness Maddington’s Powerlifting team so if any of you training there are getting curious or wanting to try the sport he’s your go to man. Reuben was a little down on previous outings but still managed a solid second place with his 450kg total which will serve as a good lead into this year’s WAPA State Championships. Heavy Duty Gym in Clarkson is really starting to come of age. Headed by Arron Cullimore the culture is building well and the team comradery is noticeable. A team of five plus supporters travelled down from Clarkson to take part in this event and with Ria Maddox taking third in the women’s section it had already been a fruitful day for the northerners however adding icing to the cake was Jason Meier standing up to win the Men’s section. Jason produced the biggest total on the day of 550kg at a body weight of 79kg that was always going to be hard to beat. 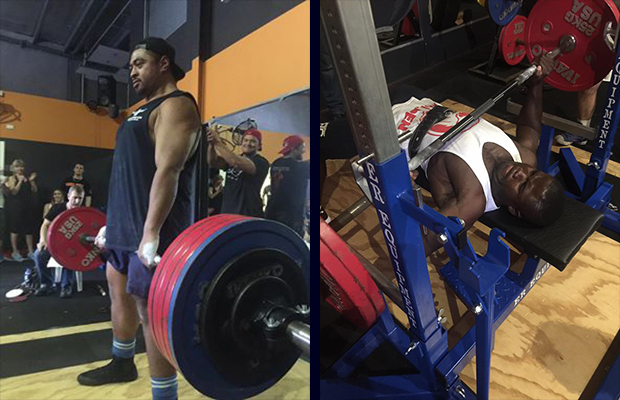 His lifts broke down to 200kg Squat, 135kg Bench and 215kg Deadlift – very even and solid numbers. Like most lifters that competed Jason’s best years are well and truly in front of him. Huge congratulations Jason on the win. Novice comps are all about giving the participants an opportunity to get a feel for the sport, while gaining platform experience in a non-intimidating and friendly environment. As mentioned in the opening paragraph the sport is definitely on the up and up. The sport is challenging and gives measurable purpose to all those hours of training but above all its fun. For many of those competing this past weekend it will be the first steps of a long association with the sport and the beginning of some great friendships; nothing bonds like the respect earned under a tonne of steel. As always I’d like to acknowledge those that rolled up their sleeves and gave their time leading up to the event and on the day to make this event a success; Event Directors Corey Miller & Julz Preston, Emcee Adam Coe, Scorers Zo Kruger and Lauren Joyner, Referee’s Stephen Ramsay, Aaron Kohn, Greg Rawlinson, Mark Ward and Karl Mauritz, Spotters/Loaders Jess Day, Rob Joyner, Joel MacCaughan and Kevin Lloyd. – To you all a massive thanks. Big thanks to WAPA affiliate and host 24/7 Power Fitness Maddington. The venue and hospitality were perfect and I know in time this event will grow in statue. The WAPA’s next events are the West Australian State Championships, being held on the 28th and 29th of May 2016, which will then be followed by WAPA newest affiliate’s first novice competition “Warriors” at Resurgence Training Centre in Port Kennedy. All events will be posted on our web page www.wapowerlifting.com.au which will be unveiled in the coming weeks.